Home » Perspectives Papers » Transition in the Middle East: Transition to What? EXECUTIVE SUMMARY: Transition is the name of the game in the Middle East and North Africa. The question is, transition to what? The answer to that question lies in an Arab autocratic push for a Saudi-led regional order that would be based on an upgraded, 21st century version of autocracy designed to fortify absolute rule. To achieve this, autocrats have embraced economic reform accompanied by social change that would allow them to efficiently deliver public goods and services. It is an approach that rejects recognition of basic freedoms and political rights, but is likely – eventually – to produce more open and inclusive political systems that ensure that all segments of society have a stake. At the core of the volatile, brutal, bloody battle convulsing the Middle East, a battle that could take up to a quarter century to play out, is the determination of Arab autocrats to guarantee their survival at any cost. Geopolitics play a major role in this ambition. To compensate for their inherent weakness and lack of the building blocks necessary for sustainable regional dominance, Arab autocratic regimes – except for Egypt, the one Arab state with the potential to be a dominant, long-term regional player – need first and foremost to contain Iran, and to a lesser degree Turkey. A geopolitical struggle dominated by the rivalry between Saudi Arabia and Iran has enveloped the Middle East and North Africa for almost four decades. In the process, it has undermined regional stability; fueled the rise of extremism and jihadism; encouraged supremacist, intolerant, and anti-pluralistic tendencies within and far beyond the borders of countries like Pakistan, Malaysia, and Indonesia; and turned the Middle East into the most volatile, repressive, bloody region in the world. Littered with the bodies of the dead and the dying, countries like Syria, Iraq, and Yemen have been scarred for generations to come and are struggling to ensure territorial integrity against secessionist ethnic, regional, and religious challenges. Possible US-backed Saudi efforts to destabilize Iran through attempts to stir ethnic unrest might mean the Islamic Republic and Pakistan will be the next victims. Countries such as Lebanon teeter on the brink. Restive populations meanwhile hang in the balance, hoping their continued surrender of political rights in new social contracts unilaterally drafted by autocratic leaders will bring them greater economic opportunity. In some countries, like Egypt, expectations have been dashed; in others, like Saudi Arabia, expectations are unrealistic and poorly managed (if at all). The successful and brutal Saudi and UAE-led counterrevolution has killed hopes and doused the popular energy that exploded onto the streets of Arab cities during the revolts of 2011, producing tyrants and mayhem. For now, it has all but erased the popular will to challenge autocratic rule that has failed to deliver or that has created expectations that may prove difficult to meet. That is not to say that popular anger and frustration are not simmering, as they were in the period leading up to the 2011 revolts. As in the prelude to the uprisings, popular sentiment remains ignored or unrecognized by officials, scholars, and pundits, who, if it explodes, are likely to be caught by surprise. No one knows whether it will in fact explode or, if it does, in what form or on what trigger. It was the self-immolation of a fruit vendor in Tunisia in late 2010 that set the Middle East and North Africa alight. 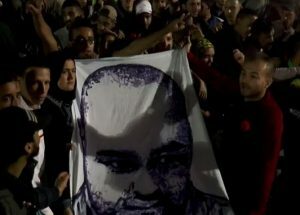 While history might not repeat itself literally, events six years later in the Rif, a rebellious region of northern Morocco, sparked by the death of Mouhcine Fikri, an unemployed street merchant, suggest the writing may be on the wall. Fikri was crushed to death in a trash compactor while trying to retrieve fish confiscated by the authorities. A year of protests since his death suggests that the effectiveness of King Muhammad VI’s constitutional reforms in an initially successful bid to co-opt the demonstrators, as well his support for the Rif’s indigenous Berber culture and promises of state investment to turn the region into a manufacturing hub, have either run their course or fallen short. Nasser Zefzafi, a 39-year-old unemployed man with an understanding of the power of social media, has, despite the government’s use of security forces, succeeded – through online videos and fiery speeches denouncing corruption and dictatorship – not only in keeping the protests alive but in encouraging their intermittent spread to other parts of the country. In June, the Moroccan capital of Rabat saw its largest anti-government protest since the 2011 revolts. Ben-Ami’s timeline might be optimistic, but his message remains valid. Regimes driven by their desire to survive are instituting government-controlled economic reform that seeks to ensure that private enterprise remains dependent on the public sector; limited social reforms; exclusionary rather than inclusionary policies; and rejection of political change. These measures might work for a while but ultimately will not do the trick. Autocratic regimes in the Middle East and North Africa are riding high, buffeted by their ability to divert public attention with promises of economic change, the specter of Iran as a foreign threat, US support for regional autocrats and the containment of Iran, and the fueling of ethnic and sectarian tension. At best, this buys the Arab autocrats time. The risk is festering and new wounds are likely to open. Four decades of global Saudi propagation of Sunni Muslim ultra-conservativism to counter what initially was Iranian revolutionary zeal, but later transformed into Iranian strategy in a long-standing covert war, has turned Arab Shiites and their militias into potent political and military forces. The specter of the Houthis organizing on the border of Saudi Arabia on the model of Lebanon’s Hezbollah is but the latest example. Autocratic self-preservation and the Saudi-Iranian rivalry, coupled with disastrous US policies, including the 2003 invasion of Iraq, have wracked countries across the region and fostered a generation of Syrians and Yemenis who are likely to be consumed by anger and frustration at their suffering and what is likely to be a slow rebuilding of their shattered countries. The very existence of their countries in their current form and within their current borders is uncertain at best. In short, transition in the Middle East and North Africa has deteriorated into a battle for retention of political control. It constitutes a struggle for the future of a region that will almost certainly produce more conflict, as well as possible black swans that could create even more havoc. It will be some time before the region comes to embrace sustainable solutions that ensure equitable economic development and transparent and accountable rule of law.